I’m a thrifter, and that means I love finding good deals! Admittedly, sometimes it’s actually cheaper to buy new than second hand, but that’s part of the fun. Finding those good deals! 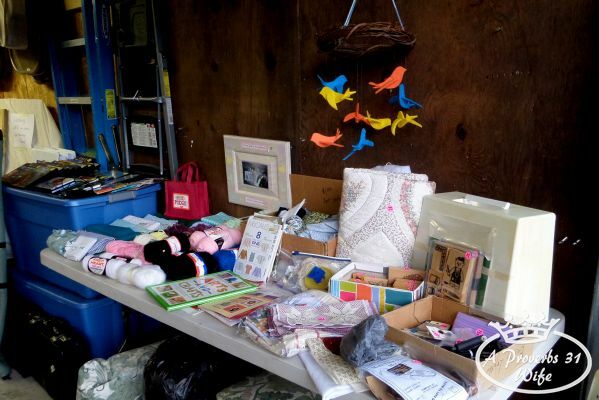 So today I have for you: Garage Sale Ideas. I like to hit garage sales during the spring and summer months. They are a great way to get things you need (or think you need) without spending a ton of money. I grew up going to garage sales with my grandma and helping her have them as well. 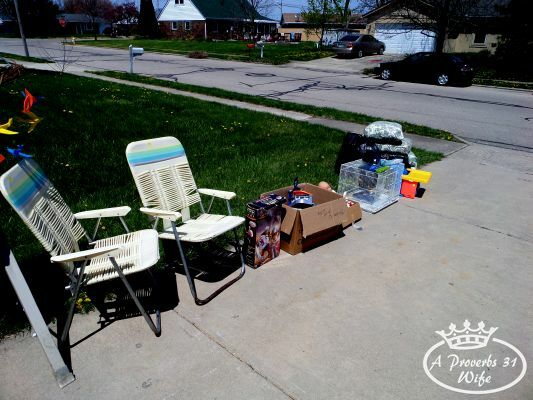 Once married, I believe we have had a garage sale every single spring. Yes, newlyweds have junk to sell too! Below is a list of things you can do to help ensure a successful sale. #1 Go onto your city’s website and try to find their regulations for holding garage sales. For 3 years, our homemade signs would repeatedly disappear, causing us to lose customers, oh, and the “thieves” were our city workers. So this year we bought big, nice, (expensive) signs and put out. Surely they won’t take these we thought, assuming the reason they took the others was that they were a little trashy looking. Nope, by noon, they too were gone. I could find anything on the website so I called and asked. Turns out we were putting them in the “wrong place”. Save yourself some trouble and find out ahead of time. 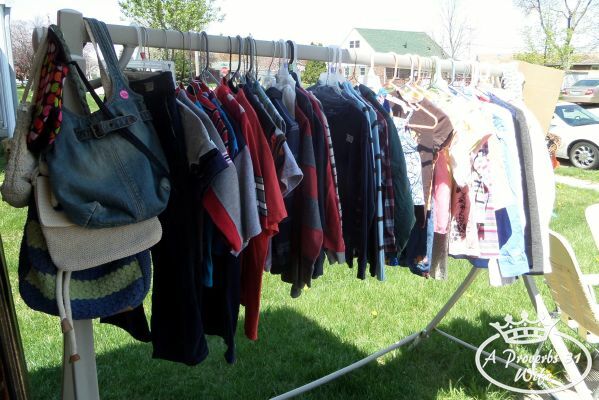 #2 Have a Multi-Family garage sale. I am far more likely to stop at a sale if I see lots of stuff. By having several families selling stuff together, you get a far greater assortment of things, than if you just have your stuff. #3 Price clearly. 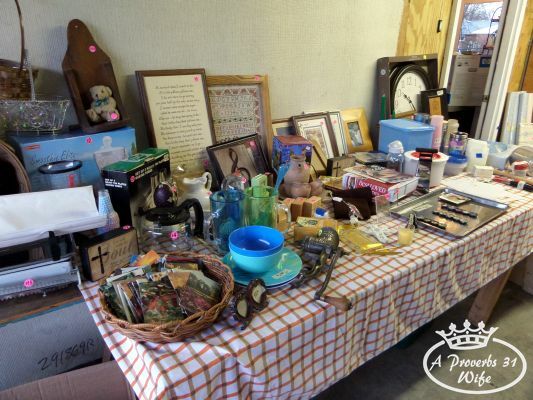 Nothing is worse than going to a garage sale that has no prices. “Make an offer” they say….. I’m left thinking do they know what this is really worth? Can I offer a low price without offending? What if I really pay to much? Most times I will just leave without buying anything. #4 If at all possible, hang all clothing. We hang everything but infant stuff. When clothes are hanging, they are easier to look through, and look nicer. 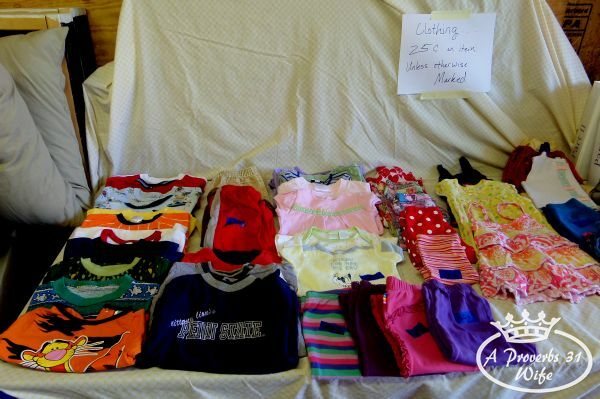 The table I laid infant clothes out on would look horrible after just one person looked through it. As a result, I would organize that table every time we had a break between customers. #5 Put things outside. My favorite items to put outside are boxes of kids toys. These boxes keep the kids outside while mom is looking at stuff inside that could have the potential to break. Most kids wouldn’t intentionally break stuff, but they are kids. Big items look great outside too, it shows the customer that there is a good variety of items to sell. #6 Organize. Try to put like things together. We usually have a table for home decor and household items (includes kitchen stuff), a crafting related table, personal care (like hair stuff, back massagers, etc. ), and well, you get the idea. #7 Expensive items need to be on a table where you can easily see them at all times. Once when my gran had a sale, I had a $75 camera walk off. 🙁 Not fun at all. #8 Advertising. You can place an ad in your local paper, but there are many other places too. Mention it on Facebook. Take clear photos and advertise on Craigslist. Many cities have local listings online too. #9 Bartering. A lot of people will offer less for items, or offer less for a cluster of items. This can be up to your discretion. I’ve had people offer crazy low prizes and I’ll counter offer. Sometimes they take it, sometimes they walk away. Here is what needs to be considered: A. how badly do you want it gone. and B. What is it really worth? Many times, the right person will pay a higher price for an item. The trick is in getting the right person. 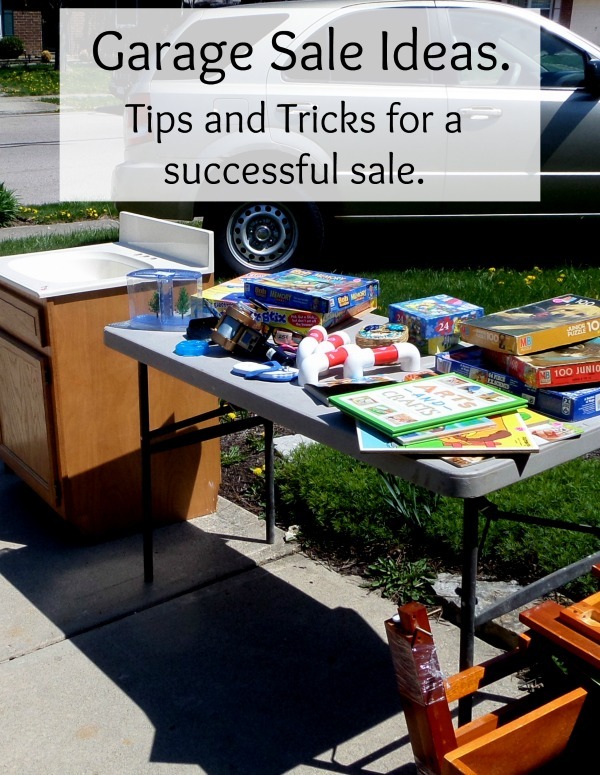 So there you have it, my garage sale ideas for success. Now, if you are wondering how my recent sale went, I have to confess: It didn’t go too well due to nasty weather on Friday. So we are actually planning on having it again in two weeks. Hopefully the weather will be nicer then. I should have a garage sale, I had a few in my day, and they have went for the most part well. They can be a lot of work. You make it look easy. Please come share at the Anything Goes linky. Thanks! I will try to get over there later. Great tips and ideas! Thank you!! I totally hear you! Sometimes I come across stuff that I haven’t used in over a year and I try to immediately put it in our “garage sale” pile. oh my gosh, is that a swing base being used as a clothes hanger? that is amazing, and so smart. we used a ladder hung sideways-i think it was resting on saw horses, or something, but this is a great idea that i will incorporate into my sale. thanks! yes, it is a swing base that we used 🙂 Ladders and broom handles can work as well. I’d add one and say GOOD DIRECTION SIGNS.. get a bright color of paper/poster board (so it will be what catches the drivers eye!) and give good instructions and arrows and address. I can’t tell you how many times I follow one sign, and then there is nothing… no other sign or no arrow on a sign, no address. Also..make your signs all the same color….that way a driver knows which one they are following and are on the right track.